Why we love it: Organic oils and extracts blend together in this body wash for a rich, emollient lather and a moisturizing after feel. 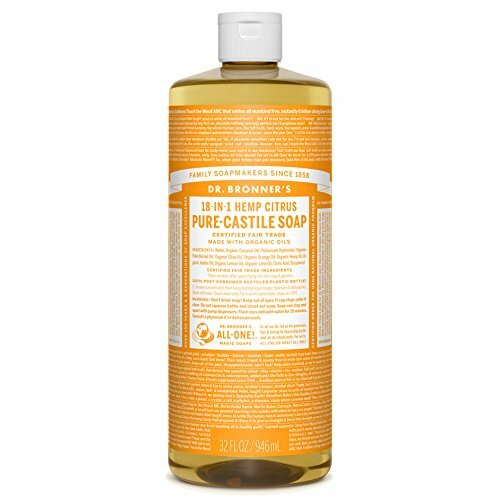 Safe and gentle, this completely biodegradable and vegetable-based liquid soap is gentle enough for washing the body, face and hair and is enriched with the subtle scents of essential oils. Available in 4 scents: Citrus, Unscented, Almond, Lavender, Rose and Tea Tree. Water, Organic Coconut Oil*, Potassium Hydroxide**, Organic Palm Kernel Oil*, Organic Olive Oil*, Organic Essential Oil blend, Organic Hemp Oil, Organic Jojoba Oil, Organic Lemon Oil, Organic Lime Oil, Citric Acid, Tocopherol *CERTIFIED FAIR TRADE INGREDIENTS ** None remains after saponifying oils into soap & glycerin. Non-GMO certified. USDA Organic. Certified Vegan. No animal testing.